I’m delighted to be hosting the Totally Money Carnival: Countdown to Christmas edition, published on 12 December 2011. In case you hadn’t noticed it’s only thirteen days to Christmas Day. Never fear, as in this edition you’ll find tips to help you have a great Christmas, as well as being frugal, banking, running a business, borrowing, budgetting, shopping and investing from lots of great personal finance sites. D.J. presents How to Handle the Budget: Christmas Conversations with Friends and Family posted at The Family Wallet. If you’re on a tight budget this Christmas, and let’s face it most folks are, then you may need to have that conversation with your family. You know the conversation. It’s the one that says, “We don’t have any money this year.” Here are a few tips to help you handle the budget conversation with friends and family. I agree; it’s silly to buy gifts if you can’t afford it and risk ending up in debt. Sustainable PF presents Green Christmas Tree Options posted at Sustainable Personal Finance. Although the author strives to stick to his financial plan, when it comes to Christmas trees he’s willing to shell out a few extra bucks to do the sustainable thing and will be looking into a potted tree in the near future. Crystal presents 5 Tips to Save You Money Holiday Shopping posted at Budgeting in the Fun Stuff. Holiday shopping can be expensive. Not only do you spend money on gifts for your loved ones, but you might also need to buy supplies for a holiday dinner or decorations for your house; here 5 tips can help you save more on your holiday shopping. Amanda presents Throw a Holiday Party without Breaking the Bank posted at My Dollar Plan. For Christmas here’s how to throw a great party while still being frugal. Philip presents Hottest New Toys for Christmas This Year posted at PT Money Personal Finance which includes a list of this year’s hot toys as well as ones from last year. Matt presents The Wow Factor: Getting the Most Bang for Your Buck posted at Living in Financial Excellence. He explains learning to rank your choices on your own personal Wow Factor scale, and you will find that your satisfaction with your budgeting and spending choices will increase substantially. I think it’s really important to be clear about what you want from life and stretching your cash as much as possible. Marie presents Are You the Next Suze Orman? posted at FamilyMoneyValues in which she describes the things which she believes contributed to Suze’s ability to rise above the crowd of personal finance experts and take center stage. A Brief History of Insurance is posted at 101 Centavos. This post was contributed by Nina Bernice and it describes the need to protect ourselves against risks and how insurance is the perfect way to do so. Personally I wouldn’t skimp on insurance but I always shop around for the best deal. Corey presents Graduation from College and Its Financial Challenges posted at 20s Finances. Graduation from college marks a pivotal point in young adults’ lives forcing them to deal with many financial challenges at one point. Jim presents What Tax Bracket Am I In? posted at Bargaineering as it’s always useful to know what tax bracket you’re in. Mr. Money presents Paying for Your Child’s College Tuition posted at Smart on Money. There are certainly other methods and tricks for saving for college and for reducing the costs once your child has enrolled. But the ones listed above should be some of the most helpful and important ones to use if you’re a parent. Saving and paying for college is a mammoth undertaking, so it’s always best to be prepared. Marie presents How to Keep Your Financial and Personal Information Safe posted at Money Spending Mommy. She highlights that taking steps to ensure that your documents and files are safe won’t take up much of your time and will provide peace of mind in the event of an emergency. Boomer presents ecoEnergy Retrofit Program posted at Boomer & Echo explaining that in Canada homeowners are eligible to receive up to $5,000 in grants under the ecoEnergy retrofit program. Penny presents Cell Phones Are Like Soup? posted at Penny Pinching Professional in which she asks if having a cell phone contract is a form of credit. I generally take out a mobile phone contract as I get a new phone and spend less on calls and data than if I were a Pay As You Go customer. Kevin presents Thousandaire Countdown #4 The Adult Baby Song posted at Thousandaire where he relates that the number four song on the Thousandaire Countdown is the Adult Baby song. It talks about an adult baby and why taxpayers shouldn’t fund his lifestyle. Jon the Saver presents Ditch Your Bank and Join a Credit Union posted at Free Money Wisdom. You need to prepare for the switch before you join a credit union and do your homework just like if you were switching to another bank. Jason presents Little Monster Late Fees posted at Live Real, Now. He describes how last week, he paid a late fee to daycare. Over the 12 years he’s had kids there, he’s paid late maybe 5 times. Sounds like they could be a little more forgiving but perhpas the US equivalent of a direct debit from his bank account could be the solution to permanently avoiding late fees? Money Cone presents If You Are Happy with Your Big Bank, Should You Still Switch to a Credit Union? posted at Money Cone asking if it’s worth switching to a Credit Union even if you are happy with your Big Bank? Unless you think this is chump change, he thinks it is worth it. Laziness in this case could be costing you dearly. Jen presents Bank of America’s new fees—$204 per year if I stay.!? posted at Master the Art of Saving. She describes how about a month ago, she received a booklet in the mail from Bank of America. This evil booklet said that she could expect some changes with account statements, expanded account numbers, enhanced online banking, enhanced mobile banking (which she doesn’t use), ability to link more accounts to one debit card and monthly FEES. I’m sure you can understand how brilliantly excited she was for these to be implemented. I’ve heard some rumours about fees being introduced on UK bank current accounts but probably no bank wants to be the first to introduce them? Kelsey presents 6 Tips for Eliminating Food Waste posted at Money Mum. Using leftovers and budgeting wisely can save money – and resources. Learn to become cognizant of how much food you really do dispose of, and then consider these tips to improve the efficiency of your kitchen. Lisa presents Creating a Budget the Easy Way posted at Thriftability. Before starting, remember that budgeting is for you. It is for your security and peace of mind. It needs to make sense to you and fit your lifestyle. No one is going to come to your house to make sure you are keeping your books ‘correctly.’ For a private citizen keeping track of their own money, ‘correct’ is what works for you. You can read my tips on making a budget. Justin presents The Right Way to Borrow posted at Money Is the Root. Recent research suggests that Brits are suffering from a post-recession hangover as far as borrowing money goes, and many people around the country are making the most of cheap interest rates to pay off debts accumulated over the previous couple of decades. Nonetheless, with finances being tight, sometimes you just have to borrow, but what’s the best way to do it? Marjorie presents Bad Credit Guide posted at CardHub.com. The arena of bad credit is often very confusing and filled with misleading information causing the consumer to sometimes feel unsure which way is up. To help you, she has compiled a “Bad Credit Guide,” which explains bad credit, debunks myths and directs you toward the ultimate goal of good credit standing. Paula presents Should I Repay Debt or Invest? – 7 Important Factors to Consider posted at Afford Anything. She explains how one school of thought says repaying your debt should always be your top priority, no matter what. But another school of thought believes that – in certain, limited cases – you can earn bigger returns if you invest your money rather than use it to repay your debt. However I’m aware of different attitudes to debt and that some debts, such as loans to start a business, get through education, or buy property in a rising market, can pay dividends. John presents How to Calculate Your Monthly Mortgage Principal and Interest Payments posted at Passive Family Income. He outlines how to calculate the exact amount of a monthly payment that goes to paying both interest and principal on a mortgage. We always tried to pay off our mortgage quickly to avoid paying too much in interest. Roshawn Watson presents Is It Possible To Live Without Debt? posted at Watson Inc. Some feel it is almost impossible to live without some debts and practically everyone has some debts in finance, except maybe very rich people. In this post he explores the truth regarding living debt free. We’re happy exponents of living debt free; yes you do have to be quite strict with yourself but it does bring peace of mind and the opportunity to plan for tomorrow rather than spending a high proportion of your income paying interest on your debt. MR presents Having Stock Dividends Pay Money For Allowance posted at Money Reasons, which explains how to establish a passive income stream via dividend stocks. I’m a bit chicken about share dealing; althought I know there can be higher returns than saving up in a bank account, there’s also the risk of losing some/or all of your capital. Odysseas presents Walmart.com Review: Be Prepared for Problems posted at Wallet Blog. While the tradition of stores being veritable zoos on Black Friday continued this year, many people turned to the Web for their Thanksgiving purchasing, hoping to score the same deals without the lines, bodily harm, and overall hassle. Unfortunately, this approach did not help Walmart.com customers like myself to save money or live better, as we all learned the hard way. Dough Roller presents Best Digital Camera Bargains for 2011 posted at Dough Roller commenting that taking pictures is a great way to keep the good memories of life close at hand, but not to overspend for a quality digital camera. Most of the time I use the camera in the mobile phone (which can fit in a small handbag). I find the photo quality to be pretty good. I do have a compact SLR camera (it’s not really very small) but I can’t be bothered to carry it around. Aloysa presents Battling Shopping Addiction: Self-Assessment posted at My Broken Coin. This post illustrates what she’s going to fight the battle against her shopping addiction. She has struggled with this problems and relates her personal story. I reckon it’s possible to spend a fortune on fashion labels, buying the latest gadgets and lavish gifts. SavingMentor presents Shopping at Costco: The Lazy Way to Save Money on Almost Everything posted at HowToSaveMoney.ca. Shopping at Costco is actually almost too easy as you always find so many great products that you never knew existed before, so you may end up spending much more than you originally intended to. To stay on budget, it is important to go in with a list of things you need and then stick to it religiously. Not spending in order to (supposedly) save money is one of my tips in my post How Not To Spend Money. Peter presents Take Advantage of Manufacturer’s Warranties, but Don’t Buy Extended Warranties posted at Bible Money Matters. He explains that if you have problems with a product to look up the specific issues on the company’s support site, and see if your problem is a known issue, and whether it is covered under the warranty. In many cases it will be covered and will be fixed free of charge. You can save a ton of money, just by checking. We never buy extended warranties but some products come with an extended warranty such as the 2 year warranty on my Samsung laptop. Miranda presents 50 Home Business Ideas posted at Financial Highway. Many of us want to earn extra money from home. And, indeed, starting a home business can be a good way to cultivate additional income, and help you reach other financial goals that you might have. From creative business ideas, to the more mundane, here are 50 home business ideas. Glen Craig presents The Best Small Business Credit Cards posted at Free From Broke. If your small business needs a line of credit, the best small business credit cards will offer up many benefits to help you and your business. FMF presents How to Run a Successful Reselling Business posted at Free Money Finance. Here are six things you should do (and things you should avoid) when starting, developing, and maintaining your reselling business. Investor Junkie presents Starting a Business: Monetize What You Know posted at Investor Junkie. Starting a side hustle is a dream for many. However, it’s easier to start a business based on something you know. You don’t always need specific knowledge to be successful with a business, but it can smooth the way. If you are expert in an area, there are ways to build a business around what you know. Linsey presents 3 Essential Questions to Ask Before Paying for Twitter Followers posted at 1099 Mom. Here are some things you need to ask before paying for Twitter followers, as failing to employ just the right strategy may, in fact, actually hurt your social media influence. I’d wouldn’t consider paying for followers to HelpMeToSave on Twitter. I prefer to be interactive although I do acknowledge that Twitter can be time consuming. Shawanda Greene presents You’ll Never Retire. Let’s Celebrate! posted at You Have More Than You Think suggesting turning the negative possibility of not being able to retire into a positive one. I plan to keep on working indefinitely, partly because I enjoy what I do, plus the uncertainty of the value of my stock market-based personal pension, making it almost impossobile to plan retirement. PKamp3 presents Should You Get a Degree or Drive a Truck? posted at Don’t Quit Your Day Job…. An analysis of it all started with a Twitter conversation on the salaries of truck drivers and college degree holders in the 24-30 degree subset. Dan presents Why You Shouldn’t Do What You Love for a Career posted at Sweating the Big Stuff in which he advises caution in doing what you love for a living. I can relate to this as I gave up my day job to become a full time online publisher, it can end up taking over your life. Miss T. presents How to Become a Vegetarian posted at Prairie Eco Thrifter. She illustartes steps you can take before you decide to stop eating meat that will help make the decision and the transition easier for you. Not eating meat has far reaching benefits: environmental, health, financial. Michael presents Fast Food Is More Expensive Than You Think posted at Begging To Retire. After spending more than $100 at a fast food restaurant just for a grilled chicken value meal, he’s reconsidering his eating habits. He factored in the time it took him to drive to and from the restuarant and wait in line for his takeaway order. I’m sure you can save on food by cooking at home, even if buy a ready made pizza and put it into oven at home, you’re going to spend less than having a pizza home delivery. Control Your Cash presents 控制现金”人造橙色鸡 posted at Control Your Cash. They’ve worked out that it can be financially savvy to eat at a restaurant. Although this seems to contradict Michael’s findings about fast food, we find especially at a lunch time buffet, that it’s sometimes cheaper to eat in a restaurant than to cook at hone. Kennedi presents Why Do I Overeat? posted at Face and Fitness which highlights new research that people eat to compensate for a lack of money and status. Paul Vachon presents Ready to Travel? – Try a Vacation Rental for Big Savings posted at The Frugal Toad. Vacation rentals are becoming a popular choice for today’s traveler because of the flexibility they can offer. Vacation rentals come in a variety of options and also offer flexible length of stays from overnight to monthly to accommodate the tourist as well as the business traveler. I often find that I can get better deals on half board, rather than staying in self catering apartments when we go on holiday, if you take in to account the money we’d spend on food and meals out. 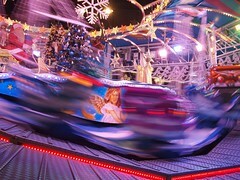 If you’d like to submit to future Totally Money Blog Carnivals, please click here. This entry was posted on Monday, December 12th, 2011 at 10:01 am	and is filed under Money Saving Tips. Both comments and pings are currently closed.